Physical Training (PT) has been a major part of the American Military since the early days of war and military conflict. American military soldiers have been widely regarded as some of the most physically fit and in-shape men and women the nation has to offer. Whether a person is a veteran or not, almost everyone is familiar with the image of a drill sergeant barking out commands while a group of soldiers perform endless repetitions of calisthenics that will ultimately give them a lean, muscular physique that looks as if it was chiseled from stone. A soldier entering the Armed Forces in this day and age can expect to spend his or her first few weeks of service fully involved in various PTrelated tasks that are designed to “whip them into shape,” and also test the physical and mental skills of the soldier. For many years, military PT has been designed around the Physical Fitness Test (PFT), which is composed of a simple series of physical tasks. Each task has a standard score that a soldier must achieve in order to be considered “fit to fight” by military standards. Training for the PFT isn’t too far removed from what some of us were forced to do by our elementary school gym teachers. Long distance running, push ups, sit ups, and pull ups have dominated military PT for many years and have served as cornerstones for soldier fitness programs. Meanwhile, the civilian world has been taken over by the “functional” era of fitness that has introduced many new concepts to Americans who strive to meet their personal fitness goals. In recent years, however, there has been a shift in the thought process of military professionals that has changed the views of standard military PT and will affect many generations of soldiers in the future. Soldiers always have been (and most likely always will be), required to perform some type of exercise on a daily basis. Throughout the military, various exercise and workout philosophies are present. Some groups and units of soldiers choose to perform exercises that will help to better prepare them for the PFT, while other soldiers may choose to use a standard weight lifting split that is better suited for a bodybuilder (i.e. chest and triceps, back and biceps, etc.). The recent shift in military PT has introduced the concept of performance training to our service men and women. The idea is to do away with standard “exercise” and replace it with “training.” Training that is designed to build explosiveness, speed, muscular endurance, and total body strength, all of which are qualities that can be found in elite level competitive athletes. In fact, the Army has actually formulated a new and improved PFT that will focus on total body factors and will serve as a better measuring stick to a soldier’s combat readiness. This new paradigm shift has caused groups and units of soldiers to take a look at their own PT and what steps they could take to ensure and enhance their ability to carry out their duties with dangerous effectiveness. Many soldiers have dropped their old exercise programs in favor of new and improved performance training methods that will better prepare them for combat. Gone are the days of endless running and sit ups, as many American soldiers are now using training methods such as Olympic Lifting, Kettlebells, Battling Ropes, Sleds, and one of the most reliable training tools of all, the Sandbag. In this day and age of exercise gimmicks and promising fitness apparatuses, the sandbag is probably the lowest technology training tool that is capable of producing the highest amount of results. Sandbags are versatile training tools that will challenge your entire body and are capable of building explosive, total body strength and stamina that is second to none. Sandbag training is popular among military soldiers for many reasons. The simplicity and ease of using a sandbag makes it a popular choice for deployments, where finding a way to perform a good PT session can often be a challenge. When our soldiers travel overseas, there is no need for them to take up space by packing unnecessary equipment, when all they really need is an empty duffle-bag and a roll of standard duct tape, which will easily allow them to make their sandbags when they arrive at their destination. For our military professionals, the benefits of sandbag training are paramount. Sandbags provide a highly effective way to train your core, grip, upper body, and lower body musculature all in one workout session. Work capacity, total body coordination, and the ability to perform tasks using an unstable and awkward piece of equipment are just a few of the great benefits that sandbag training provides to our soldiers. 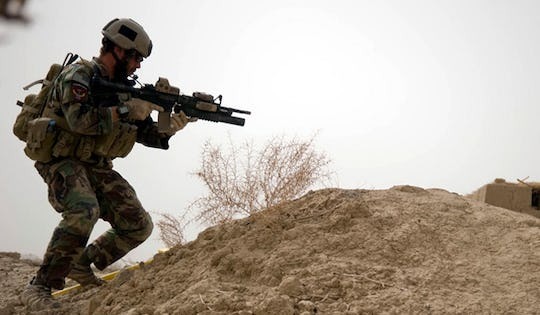 Soldiers that are engaged in combat must be able to complete a variety of tasks with little to no advanced warning, and those tasks could last for a very long period of time. Therefore, training with a piece of equipment that can prepare a soldier for that type of situation is both beneficial and essential. Although sandbags are a great addition to military PT, they can also be a welcomed addition to any training program. As I stated earlier, sandbags are easy to make and the materials are cost effective. In addition, you can’t beat the transportability of a sandbag. Now that we’ve outlined the benefits of sandbag training, it’s important to understand how to implement sandbag training into a PT program. Complex training is the most effective method of getting the most out of your sandbag training session. You can perform almost any conventional exercise with a sandbag, although a 40-pound sandbag will make most conventional exercises a little more interesting. Complex training allows you to use the weight of the sandbag to build muscle, while the repeated exercise will force your body to build endurance. The following sandbag workout is a staple to my program and is beneficial in building functional strength and stamina; great for military professionals and workout enthusiasts. Casey Kramer is a Tactical Strength & Conditioning Specialist for the U.S. Military stationed at Fort Carson, Colorado. Prior to his work with the Armed Forces, Kramer spent six years working as a strength & conditioning coach in the college ranks, where he worked extensively with elite level NCAA Division 1 athletes. Casey Kramer is a Certified Strength and Conditioning Specialist (CSCS) through the NSCA and is also a Strength and Conditioning Coach Certified (SCCC) through the Collegiate Strength and Conditioning Coaches Association. In addition, Kramer is also a Certified Kettlebell Instructor through the ATSCI. Just tried workout a. Really interesting. How many times per week should i do this? Everyday could be overtraining?